Created in 3 hours for the CATASTROPHE JAM. Organised by Andrew Shouldice and held at Volta in Halifax, Nova Scotia on December 12, 2014. Using assets provided by Andrew Shouldice and Freesound.org. 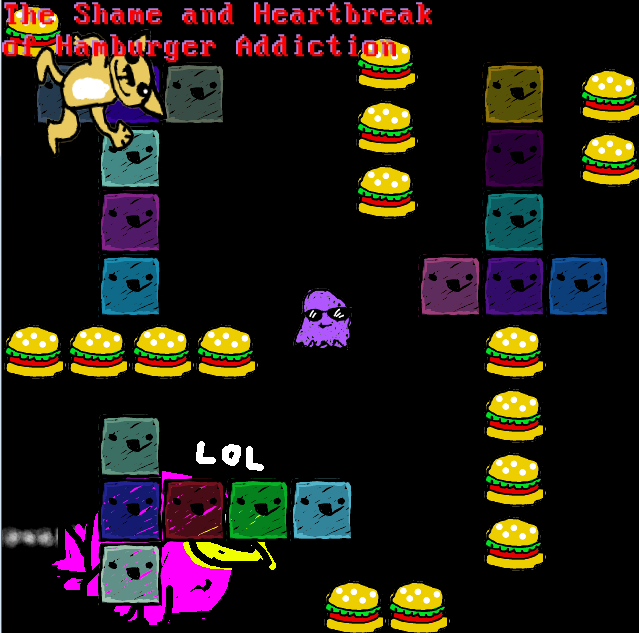 Move the ghost with the arrow keys to eat the hamburgers. Watch out for the cool cat, he’ll reset the level if he touches you. Touching the blocks will make them angry. When angry, they reset teh level if you touch them again. The cool cat will destroy angry blocks if he runs into them. Nothing can stop the cool cat. Game is only 4 levels and repeats.